I managed to get buttons when I went to Daiso at The Curve last 2 weeks. I know I could get more varieties for buttons if I go to sewing materials shop but it would mean that I have to go to KL for such purpose..huhu! The nearest will be in Taipan USJ but then it will be a hassle to find parking spot. 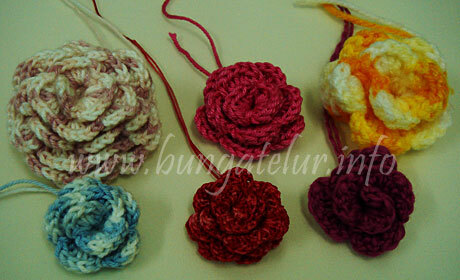 So here is the result after I sew the buttons on the crochet flowers. I am not sure what I want to do with these flowers. The initial plan is to make bookmark or tag and embellish it with the flower but at the moment I don’t have plain cardstocks to do so. It will take some time for me to sort out my collection of patterned papers of cardstock quality that is suitable with those flowers. 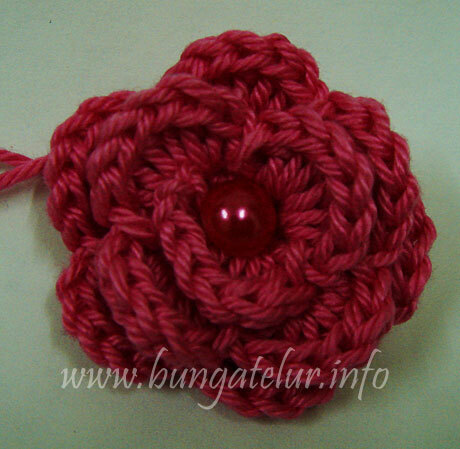 I managed to try crocheting roses..yeay! Have been experimenting with all the yarns I have, some are OK, some could be worse..haha! But still it does look like a rose. If only those people who share the instructions online would be generous to mention what type and brand of yarns they used…but even then I am not sure if I can get those brands in Malaysia. BTW, the red one was crocheted using DMC Babylon No.10 (which was bought earlier for tatting) and it was tedious as it is almost like crocheting using thread instead of the bulky yarn. This one is crocheted using the most expensive yarn I have in my possession. Went to the shop in Subang Parade and the lady there suggested me to buy this ball of yarn, which costs me RM30. But it is good for crochet as the yarn doesn’t turn furry. 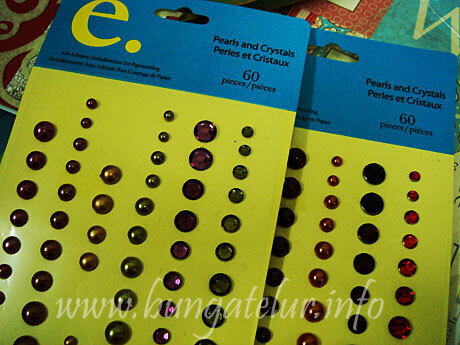 Oh, since I replenished some embellishment for my scrapbooking and card making, I decided to make use of the Prima Crystals and Pearls just for decoration purpose. If I were to use the crochet rose later on bags, headband or sun hat, I might have to sew round pearl in the centre of the rose instead of using the self adhesive pearl. But that would be another project to tackle. For now I still need to practise all the basic stitches I learn like double crochet, treble crochet, slip knot etc.